I have this funny habit of cooking a ton when it gets cold outside, and then neglecting to post here. Let’s call it my blogging hibernation…for lack of anything else creative coming to mind. And this is a frivolous excuse considering we have had a very mild winter. 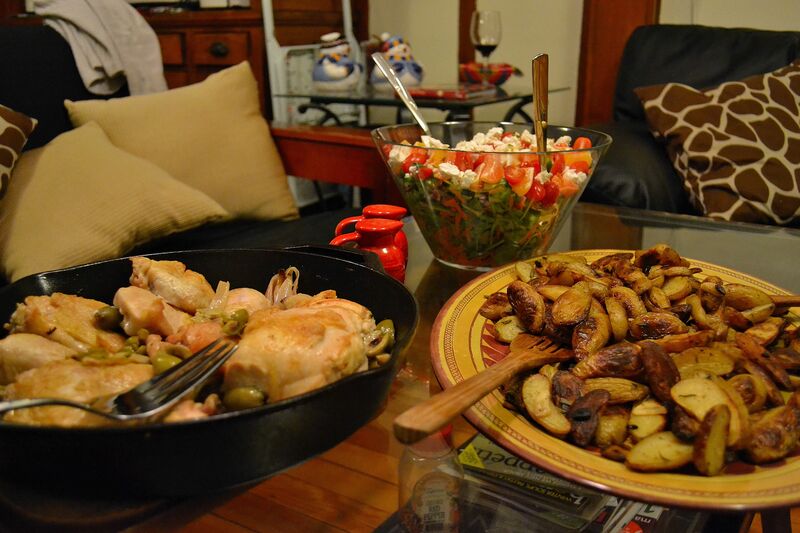 SO to compensate for my truancy, I’ll share two dishes in this post involving one of my favorite food groups: potatoes! Potatoes make for an exceptional comfort food in the cold weather…when it’s properly winter. Read on to learn more about these two lovely dishes: Rosemary Smashed Potatoes with Dill & Yogurt Sauce and a Coconut & Peanut Red Lentil Stew. From a historical perspective, the potato carries a lot of weight. It was first cultivated in modern-day Peru between 8000 and 5000 BC. The name as we know it today was a result of the Spain conquering the region, at which time the “conquistadores” named it patata. After introducing the crop to Europe through the Columbian exchange, the potato would grow to become a (if not the) worldwide staple. Yet the Spanish introduced only a handful of varieties from the Americas, which – when blight struck in the late 19th century – led to the Great Irish Famine….oof. Another fun fact is that the potato and sweet potato, albeit similar in appearance, are distant relatives. The former belongs to the nightshade family (Solanaceae) while the latter to the morning glory family (Convolvulaceae). You don’t actually need to know any of this to cook these two dishes – I just think it’s super cool. SO let’s come back up for air after that little tangent. These smashed potatoes are actually quite simple to make. The keys to success are to find potatoes that are small enough and to be patient with the smashing process. Why? Because a few will shatter or break cleanly in half (not pictured…though there were plenty). One thing I can guarantee is that the broken ones will be just as tasty, so go crazy and embrace the imperfect. You can go with or without the yogurt sauce – but the dill and yogurt combo is irresistible in its own right. Click HERE for the recipe to these salty pillows of joy. Winter and stew are like mornings and coffee – it’s impossible to make it through the first without the second (I’m aware I just confessed to loving coffee a little bit too much…moving on). What I love about this stew is you can prep most of the ingredients in advance – from the mirepoix to measuring out the spices. I prepped most the ingredients the morning of the dinner party, storing them in the fridge until half an hour before I started to cook. It made the preparation so so easy (and hassle-free). Another thing I like about this stew is its “heartiness” as a vegan dish. You purée half of the ingredients at the end, to create a thicker consistency. There is an optional spicy quotient – I used two dried chilies, with the seeds, reconstituted and minced. You can use less (or more if you are a little crazy). This stew also keeps very well, and is more flavorful on day #2 – thanks to sitting with those lovely spices overnight. Whether this is for a dinner party or a week of lunch prep, this one is a keeper. Click HERE for the recipe to this hearty and healthy winter comfort. Given the centrality of the potato’s “staple” status for this post, I wanted to pair these dishes with a work that could convey their colorful depth while staying true to this concept. That brought me to the iconic lied (or lieder, for plural): which is German for “song”, and came to represent a musical style that embraced poetry and voice. The lied was (and still is) a staple for many composers. The style dates back to the 12th century, where the majority of the writing was monophonic. Yet as the the art form evolved, polyphony prevailed as voice plus piano (or orchestra) became the prevalent structure. The lied truly flourished in the 18th and early-19th centuries with the advent of Romanticism. Beethoven, Strauss, Brahms and other great composers produced some of their most epochal works as lieder; specifically as song cycles (where a theme or story ties together all the lieder within a set). Perhaps my favorite example of a song cycle is Robert Schumann’s Dichterliebe (Poet’s Love). Schumann wrote the work in 1840, impressively within the span of a week. The music is set to a series poems by Heinrich Heine: painting the tale of a man enraptured by love, only to hopelessly discover it is an unrequited passion. The below recording features the tenor Fritz Wunderlich, whose performance of Dichterliebe is still held as the gold standard. The songs arequite short, and perhaps the two most famous in the series are the opening, “Im wunderschönen Monat Mai” and “Ich grolle nicht” at 7:17. Enjoy! It’s insane to think that Fall is nearly here. Looking back on the last 3 months, this summer has been both adventurously beautiful and extraordinarily hot. I got a taste of the West Coast for the first time in my life in Seattle, which involved a lot of time in the outdoors, and was able to enjoy a much-needed break following my time at NYU Stern. The picture above was taken at lake in the middle of Snoqualmie Pass: not pictured is me, out of breath and sunburned, very much looking forward to a big meal. Fortunately, we had a great dinner waiting for us back home of Steak au Poivre and Blue Cheese Mashed Potatoes with Roasted Garlic. Mashed potatoes are great on their own – but add some blue cheese and roasted garlic, and you may ask yourself “How have I made it this far without these potatoes?” Ok, maybe that was just me…but trust me when I say this is a solid companion to steak. I like to use red-skinned potatoes and keep the peels, to add some character to the dish. If you want a creamier mash, opt for Yukon Gold, since you will risk overworking the mash if you try to achieve the smoother consistency with red potatoes. Can’t find blue cheese? Gorgonzola is a fantastic substitute (as I shared in my latest blog post). Click HERE to see the recipe for this irresistible side. Steak au Poivre is French for “pepper steak”…which seems to leave a lot of room for interpretation. However, the traditional preparation involves peppercorns (naturally), heavy cream, and brandy. Any number of adjustments can be made from here. Some chefs insist on the traditional sauce trio, while others (including my favorite, Julia Childs) call for a more unique take with cognac, stock, and multicolor peppercorns. So as you can imagine, the various interpretations on this dish are indeed appreciable. Our recipe here will use only the basic, with a “lighter” sauce than some of the top hits on Google. But the key is to get a solid cut of meat. We found two reasonable cuts of filet mignon, but sirloin or strip will also get the job done. Tom learned how to make this recipe from his mom, Virgina. As to the interpretations I referenced, there are two key differences when it comes to the sauce: where the alcohol is used either to deglaze the pan or for a flambe. Virginia’s recipe calls for the latter, which makes for a very cool photo op. An important note on cooking with open flames: things can go from cool to bad very quickly if you don’t take the right precautions, so always off the heat (especially if you’re working with a gas stove) and move the pan away from any overhead materials that may be flammable. But it’s definitely a fun party trick if you’re hosting. Click HERE for this classic take on a beloved dish. In considering a pairing for this piece, I was tempted to go with Stravinsky’ “Firebird” or a Debussy for the all-too-obvious reason. But I wanted to give more attention to the depth of the dish’s richness and flavor, and thus felt like Dmitri Shostakovich would be a great companion. I’ve never paired anything on this site with Shostakovich, so I’ll first talk about the man himself before elucidating the musical pairing. Dmitri Dmitriyevich Shostakovich was born in Saint Petersburg in 1906, and many classical musicians have come to recognize his musical voice as an expression of the creative struggles beneath the Stalin regime. His compositions aggregate a variety of styles, from strong Russian tones to dissonant protest to haunting melodies. To illustrate this variety: perhaps his most famous work is his fifth symphony, which was received phenomenally well by the conservative tastes of the Soviet public. Yet this followed on the heels a highly divisive fourth symphony, which premiered more than two decades after its completion due to its unorthodox nature. Today, historians debate the inspirations for and meaning behind many of Shostakovich’s works. So naturally, there are many interpretations. However, one set of German “ingredients” institute some consistency – the signature “DSCH” motif: which alludes to the German spelling of his name, Dmitri SCHostakovich, as well as the German locution for D (De), E-flat (Es), C (Ce), and Ha (B natural). This parallel to the blog’s dish leads to our musical pairing, where the DSCH motif is perhaps the most discernible: String Quartet No. 8 in C minor. The quartet, composed in the summer of 1960, was an homage to the Dresden casualties of 1945; where close to half a million were killed in an Allied air raid. He wrote “In memory of victims of fascism and war.” And the first four notes you hear are the DSCH motif. I first heard the piece my freshman year at the New England Conservatory, and it had a profound effect. The following recording is with the Borodin Quartet: an ensemble which traces it history back to the Soviet Union and had a close working relationship with Shostakovich himself. Enjoy! This dinner was a FANTASTIC way to launch this new blog, and (as always) a great excuse to spend time with friends. Before diving into the chronicles of these recipes, I want to say how lucky I am to be surrounded by such wonderful friends – cooking has no purpose without good company. The salad was the contribution of my dear friend Tim Wilfong. A veggie through-and-through, he wanted to bring a side that would complement our main dish as well as his (veggie burgers – nothing too fancy, but he claims it was the perfect match). 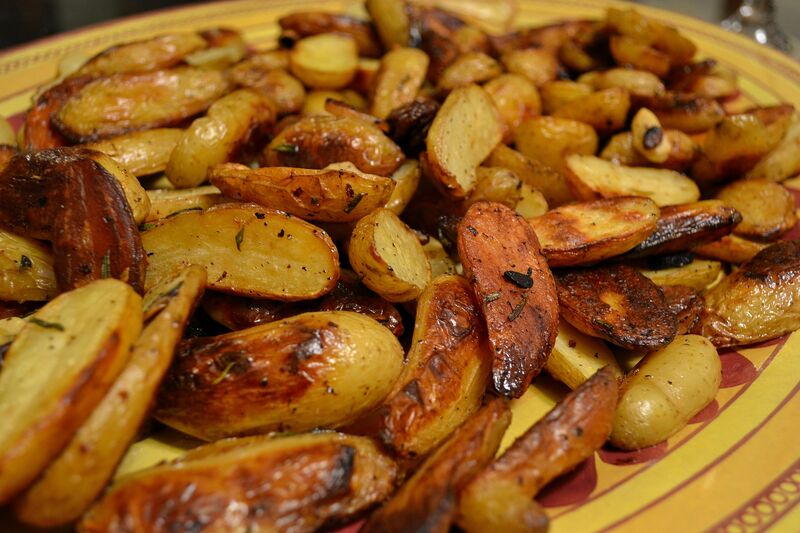 So about the potatoes – potatoes in general are an easy sell: mashed, roasted, baked, fried, scalloped, etc. You can almost always guarantee that any crowd will love a potato dish. These, though, exceeded everyone’s expectation! While these beautiful, golden potatoes can stand on their own, the added flavors are what bring this dish up a notch: crispy garlic slivers, freshly crushed rosemary, and zesty lemon. Oh.My.God! My advice? Let these guys cook longer a little than you’d expect (without burning them, of course!) The amount of olive oil used in the recipe will protect the potatoes to a longer heat exposure, so don’t fret. Some modifications: The end of the recipe calls for tossing the potatoes in the leftover lemon/rosemary vinaigrette – I wouldn’t recommend more than a tablespoon (or two). Trust me, you want to maintain that crunchy goodness, and too much oil will just make a soggy mess. 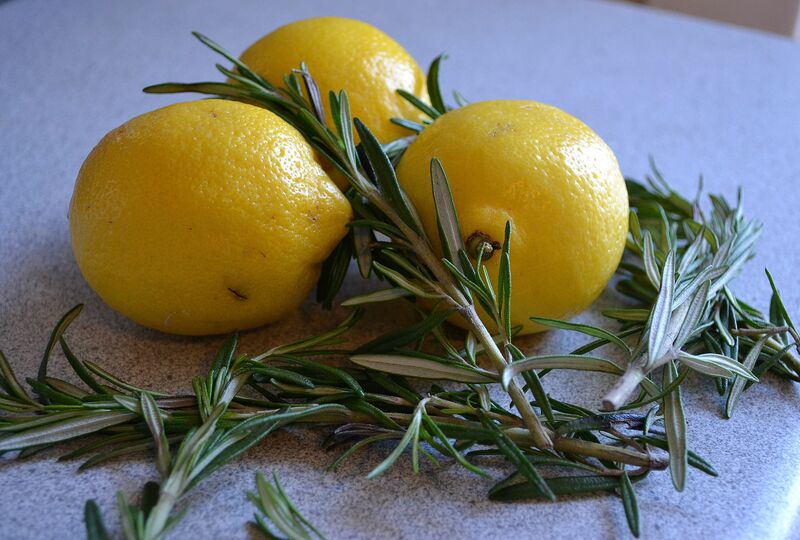 The original recipe also calls for dill, but I went with rosemary. You can view this recipe HERE. Here’s where our regional fare gets an exotic twist. This method of roasting calls for the chicken to be separated into 8 pieces (a process you can do on your own, though I highly recommend asking your butcher to do this for you), then cooked in a large oven-safe pan. Lemon and sage stay true to our Italian taste, but we journey closer to the Mediterranean with a curveball – brined green olives: a fruit native to the Mediterranean region, appearing in Egyptian chronicles dating back to 17th century B.C. Green olives are unripe and much firmer than the black and brown varieties, so they have to be cured with a lye solution to soften the fruit’s flesh. * This dish packs a LOT of flavor, and is a definite keeper. 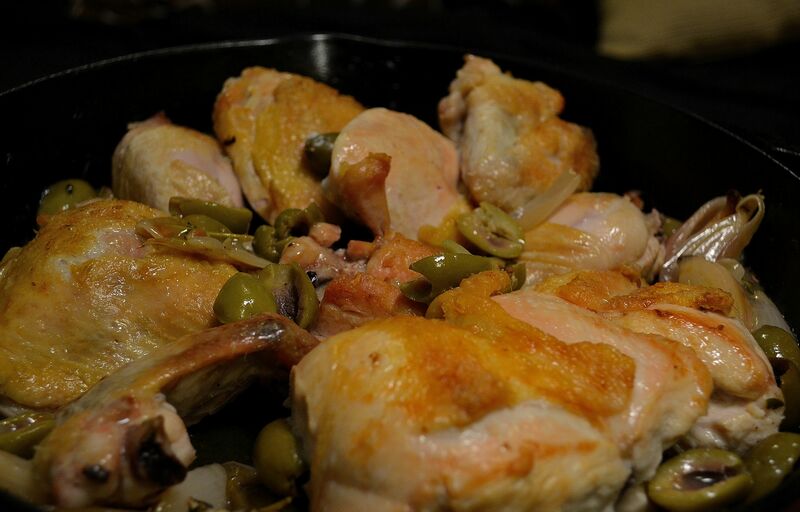 A few variations: I placed the chicken directly under the broiler for the final stage of cooking to deepen the flavor and color. I also thickened the sauce slightly at the end to make a quick gravy. 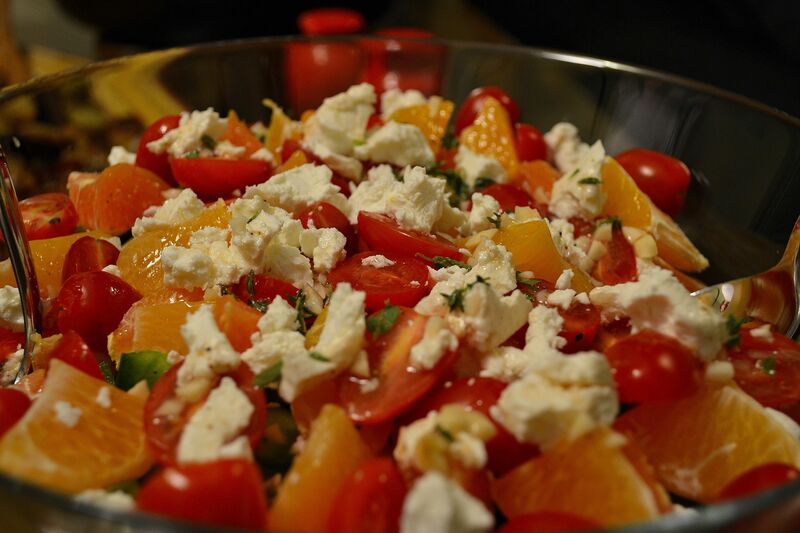 To check out this fabulous recipe, click HERE. Even though I created this blog to expand my cooking repertoire beyond sweets, dessert is still a must at all my dinner parties. This dessert was the PERFECT selection for a launch menu. 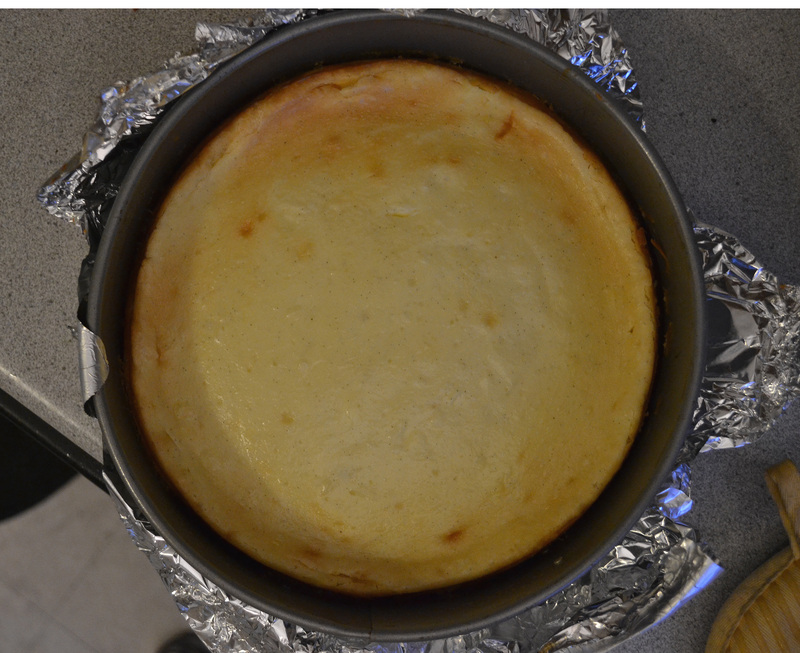 With a gorgeous texture and depth of flavor, this WILL be my go-to cheesecake recipe from here on out. The original recipe called for a roasted pineapple topping…which probably would have been fantastic if I had the energy to make it, but fresh blackberries were the perfect touch. If there is anything you take away from this lengthy first post, it should be this recipe. My recipe notes: do NOT overmix the batter, or an unseemly crack will be inevitable, and use real vanilla bean. While vanilla extract is obviously cheaper and easier to manage, this cake would lose half its charm. Finally, don’t substitute sour cream for the crème fraîche – the tangy, light flavor is what makes this recipe! 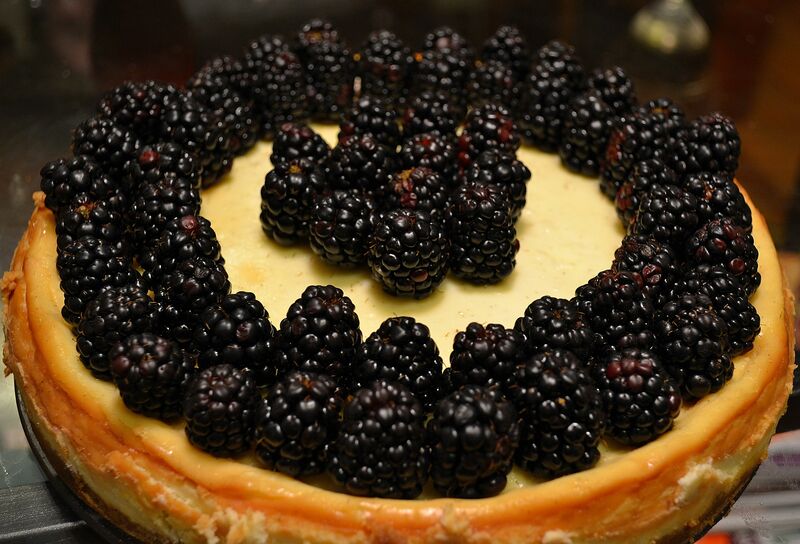 You can get the recipe for this cheesecake HERE. Given our “twist” in ingredients and method, I feel it only appropriate to take a detour in genre when considering a musical pairing for this menu. I needed a piece that appeared Italian, for all intents and purposes, but contained elements of diversity. My friend Nate Lofton gave the perfect suggestion: Mendelssohn’s Symphony No.4, Op.90 “Italian“. A German-born composer of Jewish descent who studied briefly in France, Mendelssohn was inspired to write this work following his travels in Italy. ** I have included a recording of the first movement below with The Simon Bolivar Youth Symphony Orchestra of Venezuela – arguably one of the best up-and-coming professional orchestras today. Enjoy!